The SL-C7 was a remarkable video for its day. At first sight it looks similar to the SL-C5 but it is an infinitely superior machine. It came on to the market in 1979 as the top of the range machine and was an instant market leader. With a stylish hi-tech design which put the controls under several tuck away flaps the C7 boasted advanced features not seen in domestic video at that time. The video had full infra-red remote control, multi-event 4 event 2 week timer, APS index marking, microphone input. Also there was full colour in cue/review modes. 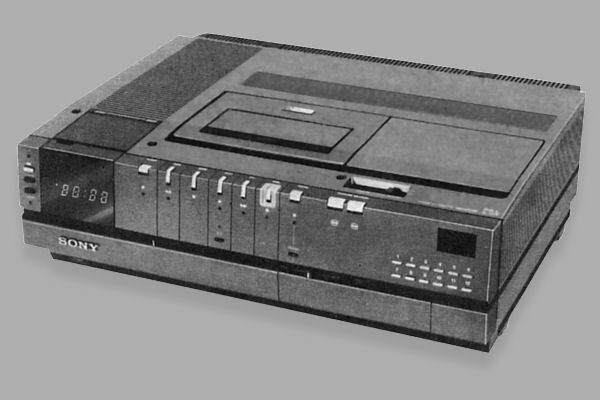 Later production SL-C7, identified by an embossed Beta logo on the front flap also had the ability to interface with a multi changer, called a Beta Stack. This was an add on unit which sat on top of the video and would automatically change the cassette tape. Earlier units required a modification before they could operate the changer. Another site which has information about this model is Hamid's site. Below is a picture of the Wega Video3. This is rebranded version of the SL-C7 and has a slightly different colour to normal. The picture was kindly submitted by Maurice Hamm.